My good friend, Lindsey, and I were working together one day, and I whipped out a can of chipotle peanuts I had gotten at the grocery store the previous day. I never really buy peanuts, but I pretty much buy anything labeled “chipotle” “Sriracha” or “spicy.” I love spicy food, okay? Who else is with me? So I opened them up and offered Lindsey some, and they were pretty amazing! Good job, Planters! 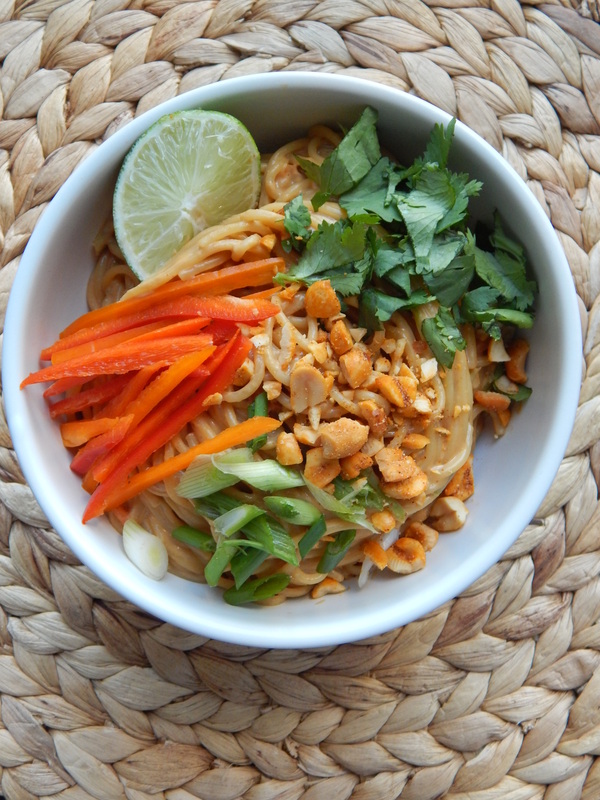 Then my friend started telling me about these Thai Peanut noodles she used to have all of the time at the Cheesecake Factory. She said it was her favorite dish there, but they no longer make it. And the more she told me about them, the more delicious they sounded, and the more we wanted them… like ASAP! I decided that I would try to recreate the recipe for her. I knew that it would be hard, because I had never had them and wouldn’t know what they were supposed to taste like, but I decided to try it anyway. 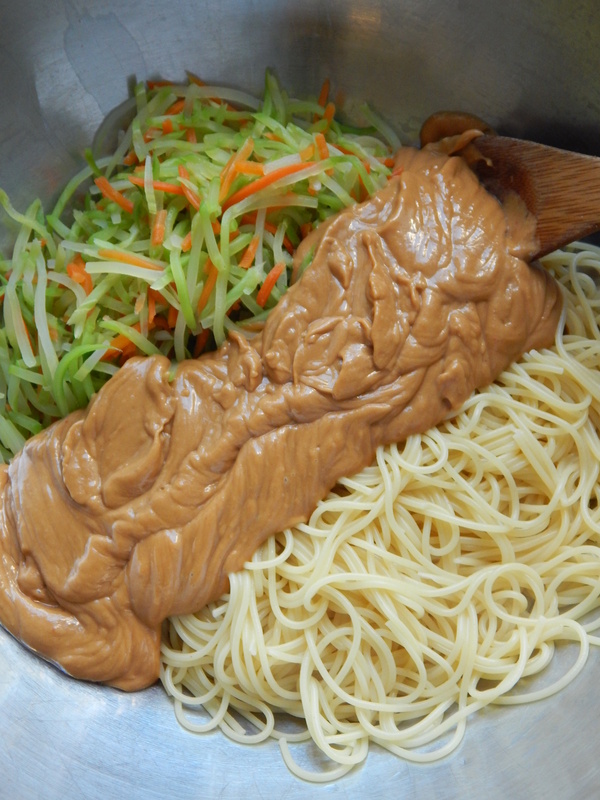 Next I did what any normal person would do… I spend an undisclosed amount of time Googling these mystery noodles. 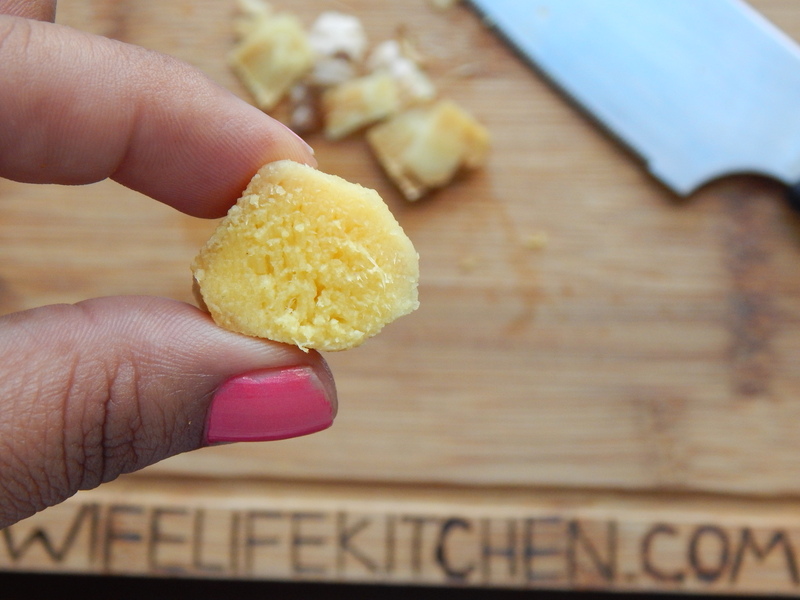 That week I researched, I grocery shopped, I tested and tested, and came up with this recipe! We both loved it. She said it tasted very similar to the dish she remembered, and we both thought it was awesome! When I first tasted the sauce I was blown away by the flavor. I mean, I was having a moment! It’s just that good. I love that this recipe came out of nowhere. Really we were just sitting there having some spicy snacks, working and talking. Thanks for this idea, Lindsey! Seriously, so good. 1. 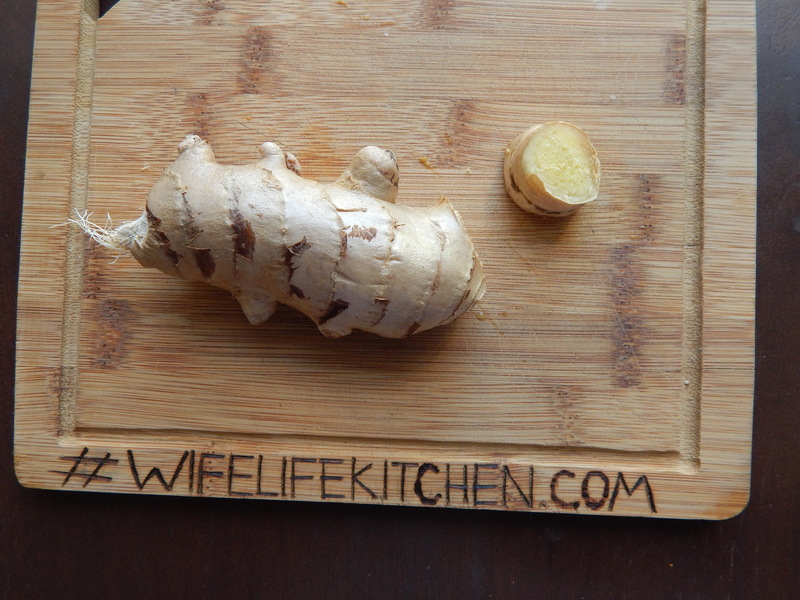 Prep all of your garnishes and set aside. 2. 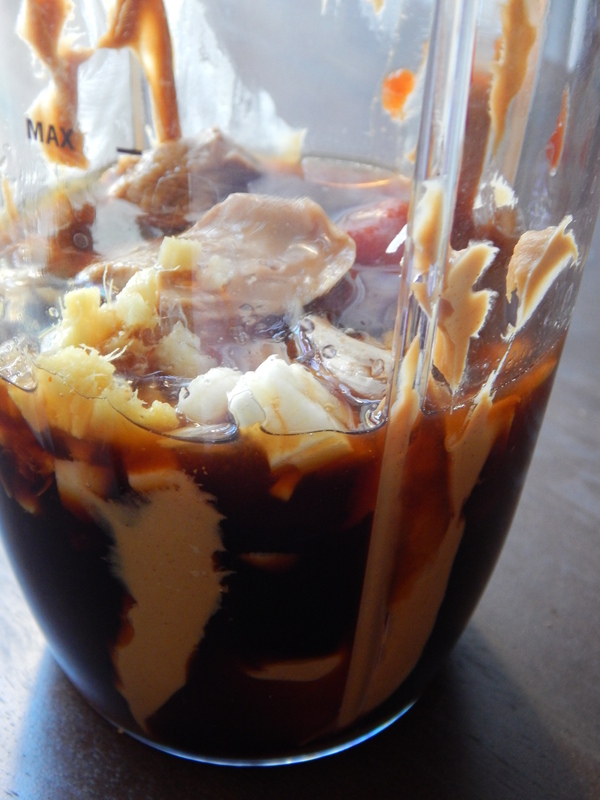 Combine all sauce ingredients into a blender and blend until smooth. 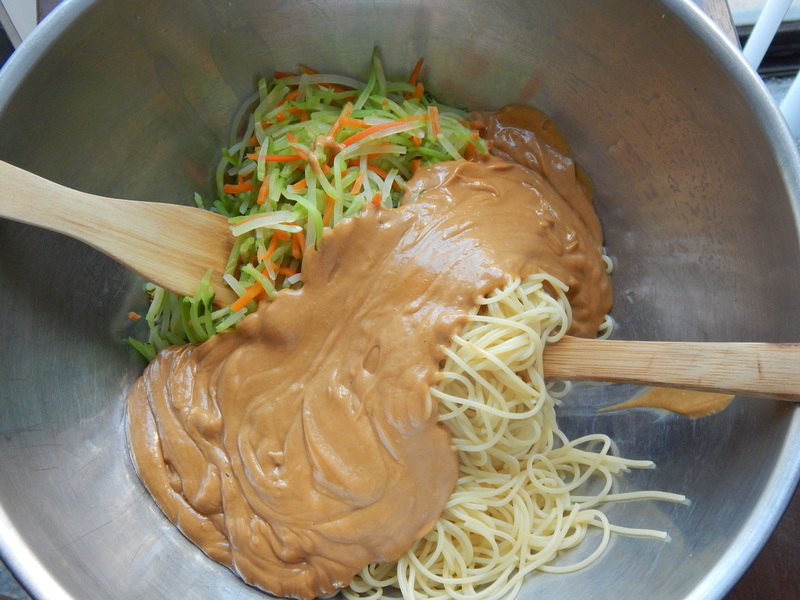 Once the sauce is blended add it to a large mixing bowl. 3. 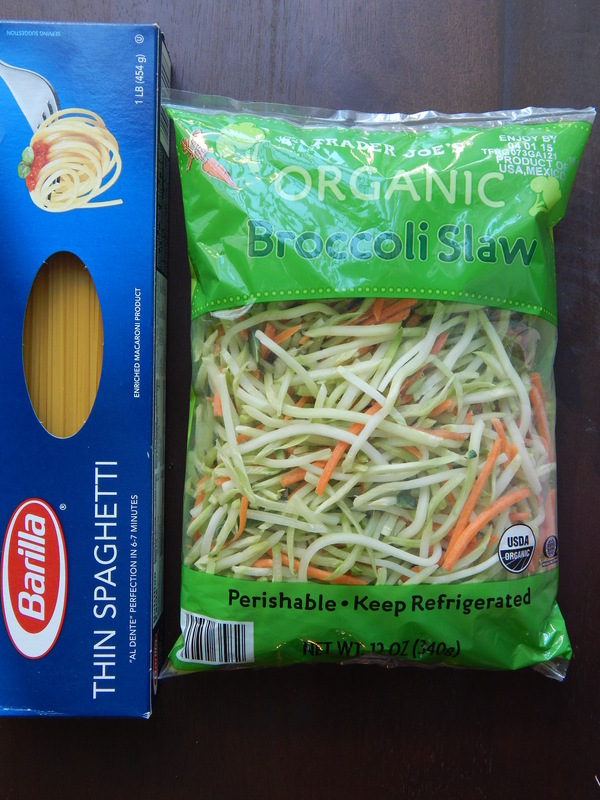 Cook pasta according to package directions in a large pot, and remember to salt the water. 4. While the pasta is cooking, add water to a medium sized pot and bring to a gentle boil. Once the medium pot comes to a gentle boil add sea salt and the broccoli slaw to the water. Cook for 2-3 minutes then remove from the pot and drain. 5. 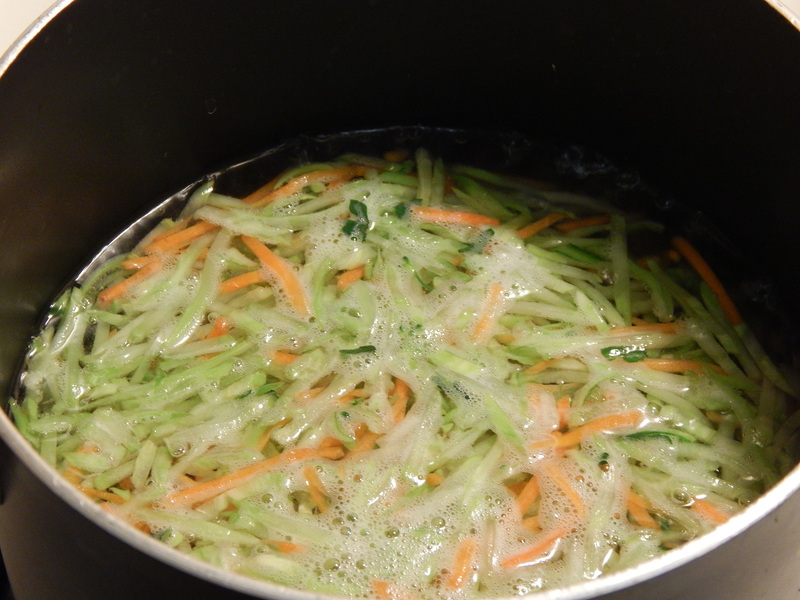 Add the broccoli slaw to the large mixing bowl along with the sauce. 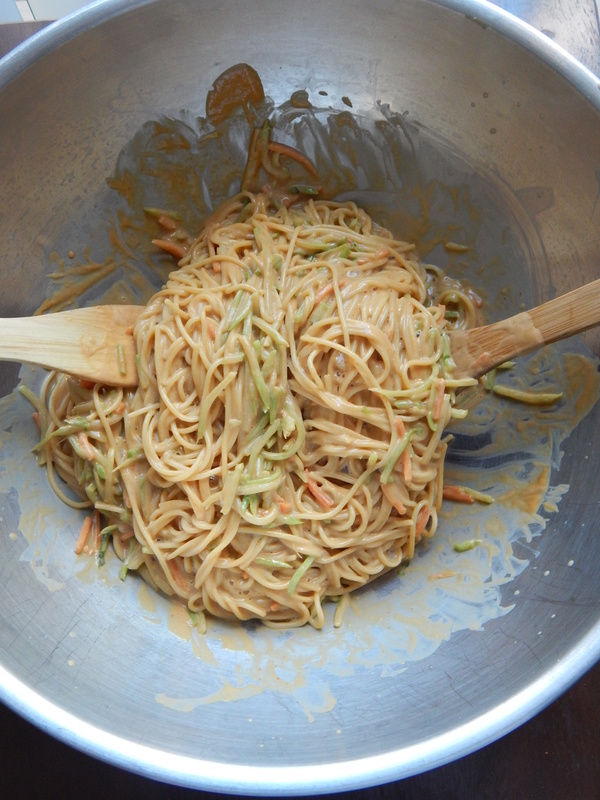 Once the pasta is cooked, drain and immediately add to the mixing bowl as well. 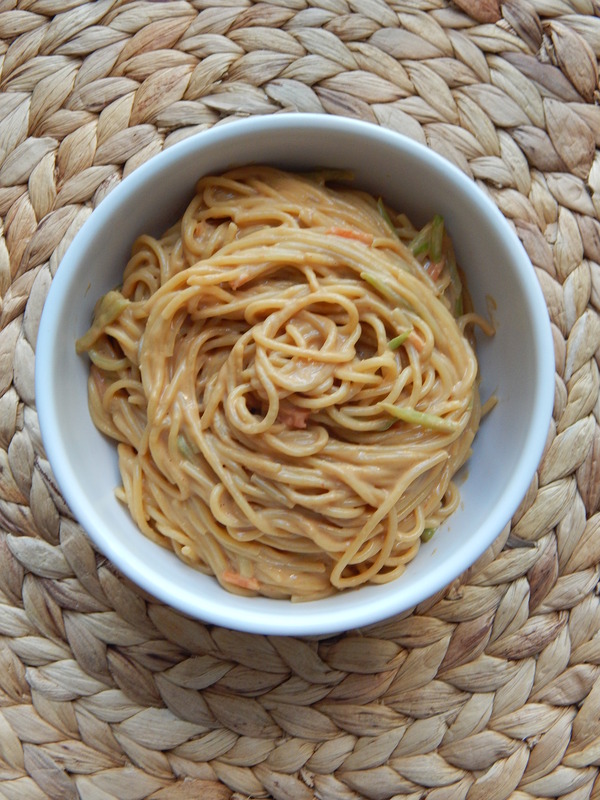 Toss the noodles, slaw and sauce together to combine and serve immediately. 6. 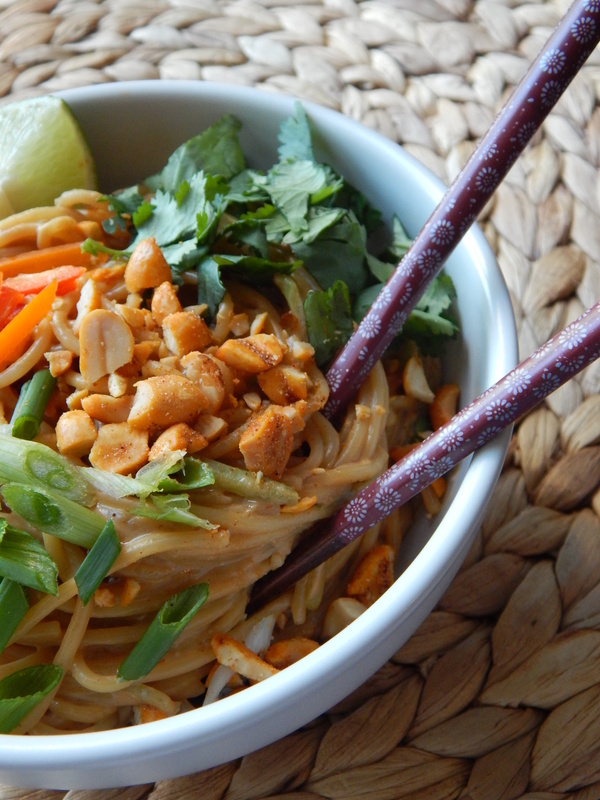 To plate, add desired amount of noodles to a serving bowl and top with garnishes. 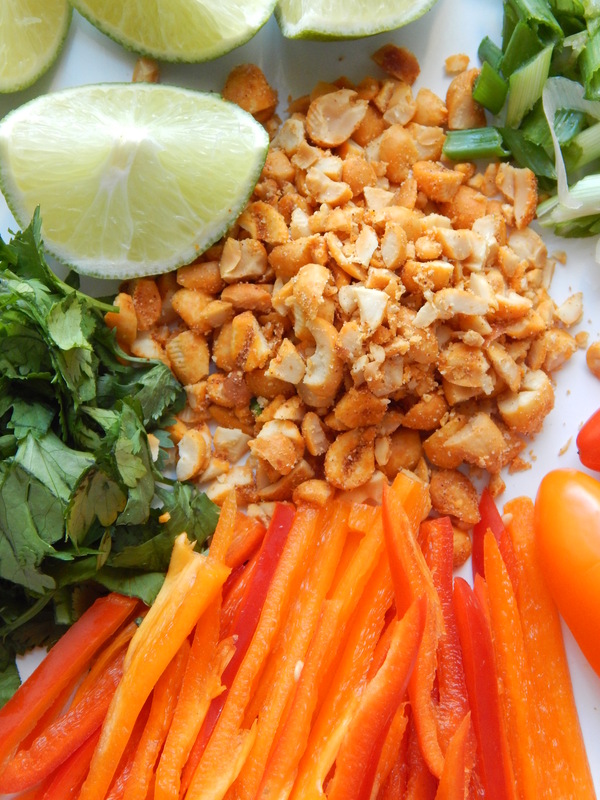 Serve in individual bowls or on a large platter family style. 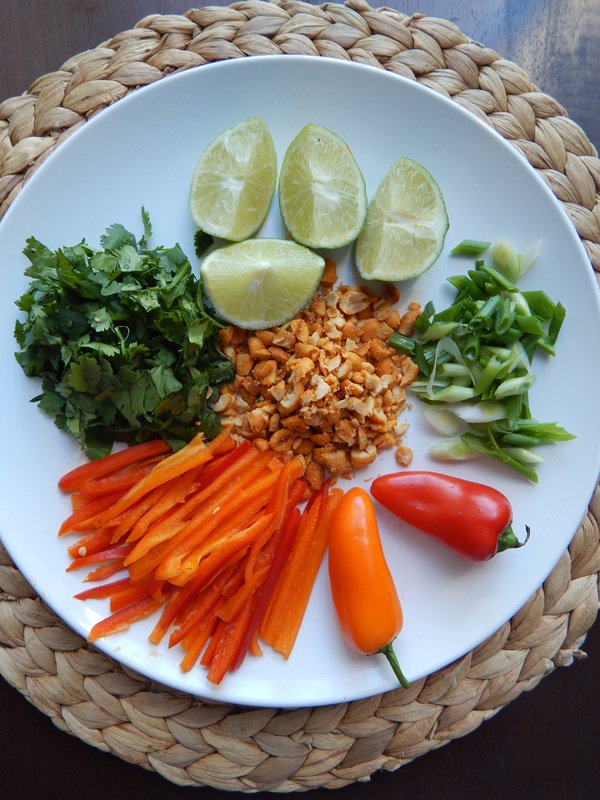 • This sauce has a thick consistency. 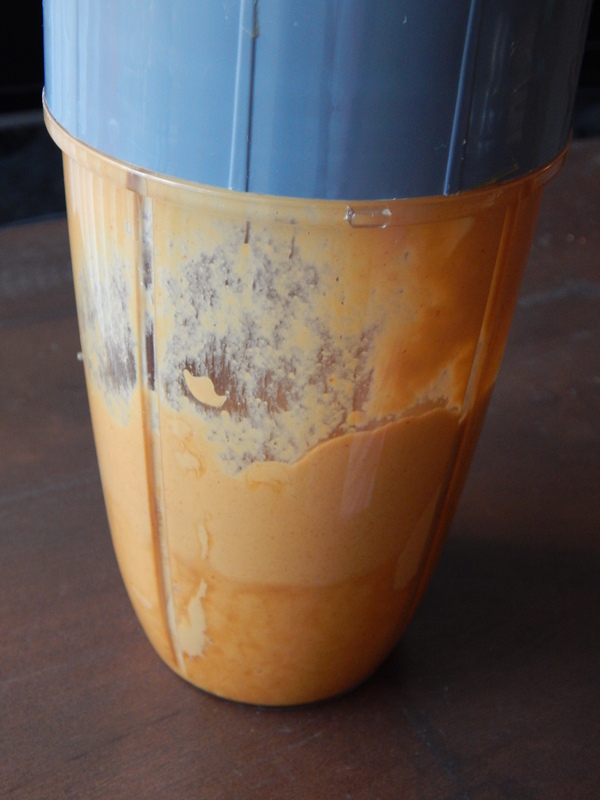 If you would like it thinner, add an extra ¼ cup of warm water in the blender. 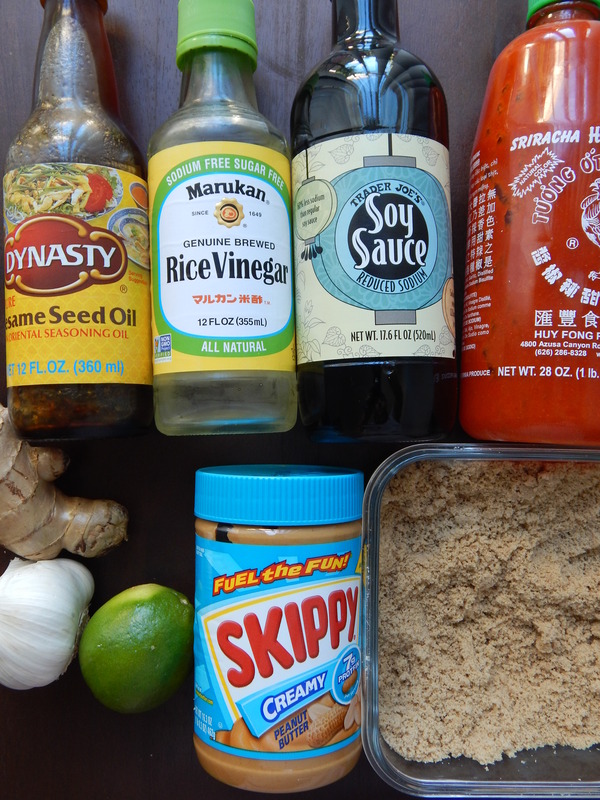 • I use my Nutribullet for blending this sauce, and it works great! 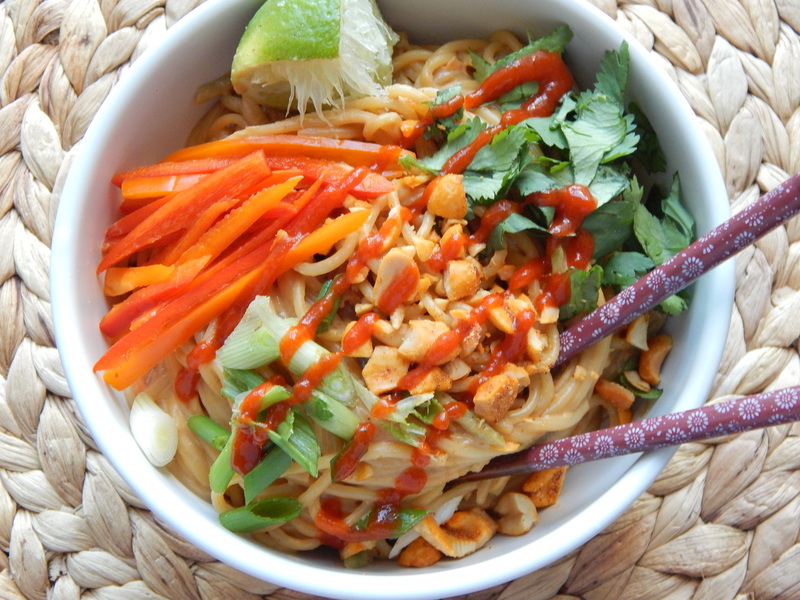 • I used Planters Chipotle Peanuts I found at my local Stater Bros Market for this recipe. Feel free to use regular salted, unsalted, or any roasted peanuts of your choice. • Reheating: When reheating in the microwave the next day I found it helpful to add a little splash of water to loosen up the sauce. Haha!!! That’s what my best friend said to me as well. Lol I hope you do try it and if you do I hope you enjoy it!!! 🙂 let me know how it goes! !